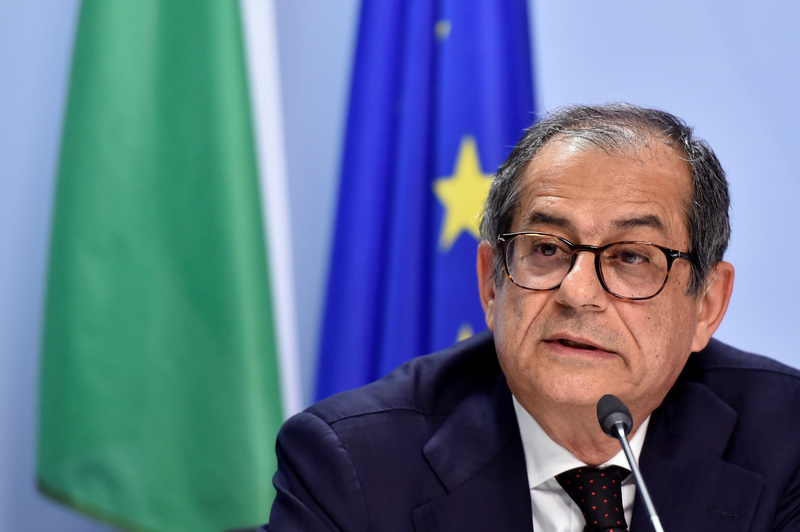 Italian Economy Minister Giovanni Tria holds a news conference after a Euro zone finance ministers meeting in Brussels, Belgium November 19, 2018. Italy’s anti-austerity government on April 9 slashed its 2019 growth forecasts to 0.2 percent – the weakest in the euro zone – from a previous forecast of 1 percent as it published the first framework of its 2020 budget. Italy also hiked its 2019 deficit to 2.4 percent from a commitment given to the European Commission last year to stick to 2.04 percent, while it predicted public debt would hit a new record high of 132.6 percent of GDP. The government wants to avoid raising sales taxes worth 23 billion euros in 2020 while at the same time delivering income tax cuts worth an estimated 12 billion euros. Failure to compensate for these measures with spending cuts risks further boosting Italy’s debt next year.